Hi people! How are you? Even though it's winter here, in the Northeast, where I live, it's always very, very hot (it seems like summer all the time! Lol!) Whoever lives here knows!). Always a good request for a walk in the park or on the beach, to go to a ballad, or even to be good at home, is not it? And speaking of light dresses, I met this week the international Yoins.com store and found beautiful dresses and dresses! Well in the style of women who enjoy this trend. The Yoins store was founded in 2014 with the mission of giving everyone an opportunity to express themselves through high quality fashion at an affordable price. They believe that fashion is the best way to display their individuality and uniqueness, and that is why they work tirelessly to bring out the best new trends as they arrive. The store not only sells women's clothing. Yoins has accessories (jewelry, handbags, hats, belts, glasses, shoes, temporary tattoos), lingerie, gym clothes etc. I made a wish list with fashion casual dresses online for women and fashion tops online for women to inspire you! Everyone would use it, of course, but at the end of the post I chose my favorites. I hope you like my selection of Casual Dresses and Fashion Tops from the Yoins store! Check out what beautiful pieces! Fala, Gente MaraviLinda! Como estão? Mesmo que seja inverno por aqui, no Nordeste, onde resido, é sempre muito, muito quente (parece verão o tempo todo! rsrsrs... Quem mora aqui, sabe!) e, por isso, as roupas soltinhas e de tecidos leves são sempre uma boa pedida para um passeio no parque ou na praia, para ir a uma balada, ou até mesmo para ficar de boa em casa, não é? E falando em vestidos leves, conheci esta semana a loja internacional Yoins.com e nela achei vestidos e conjuntos lindos! Bem ao estilo das mulheres que curtem esta tendência. A loja Yoins foi fundada em 2014 com a missão de dar a todos e todas a oportunidade de se expressarem através de moda de alta qualidade a um preço acessível. Eles acreditam que a moda é a melhor maneira de exibir a sua individualidade e singularidade, e é por isso que trabalham incansavelmente para trazer as melhores novas tendências assim que chegam. A loja não apenas vende vestuário feminino. A Yoins possui acessórios (joias, bolsas, chapéus, cintos, óculos, sapatos, tatuagens temporárias), lingerie, roupas de academia etc. 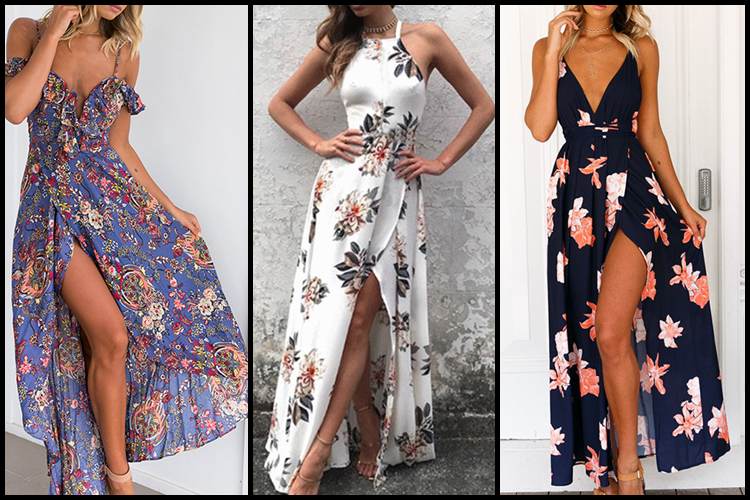 Fiz então uma lista de desejos com vestidos curtos e longos, de tecidos estampados e lisos, e também conjuntos com estampas e tecidos lisos para vocês inspirarem-se! Todos eu usaria, claro, mas lá no fim do post eu elegi os meus favoritos. 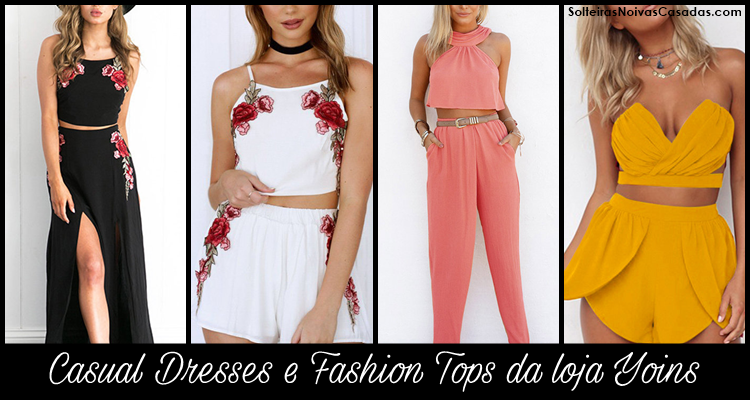 Espero que gostem da minha seleção de Casual Dresses e Fashion Tops da loja Yoins! With ruffles, cuffs, symmetrical or asymmetrical, accented or soft ... These dresses are perfect to take a walk during the day. Com babados, com alcinhas, simétricos ou assimétricos, acinturados ou soltinhos... Estes vestidos são perfeitos para dar uma voltinha durante o dia. Fashion trend, lace dresses, ruffle and pompoms are pumping! Tendência de moda, vestidos com laço, babado e pompons estão bombando! Legs to the show! Cracked dresses are there like a super trend that never goes out of style. And if the dress is printed, it's the face of summer 2017/2018! Pernas à mostra! 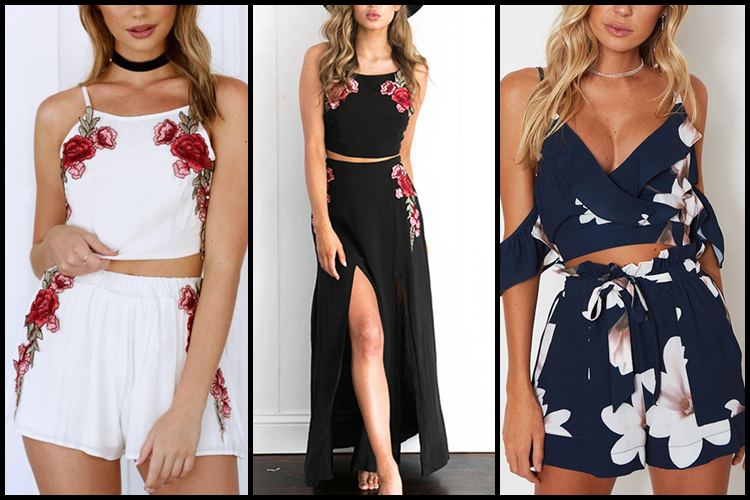 Vestidos com fendas estão aí como uma super tendência que nunca sai de moda. E se o vestido for estampado, é a cara do verão 2017/2018! Stylish, these plain fabric dresses look gorgeous in a more formal reception type a wedding. 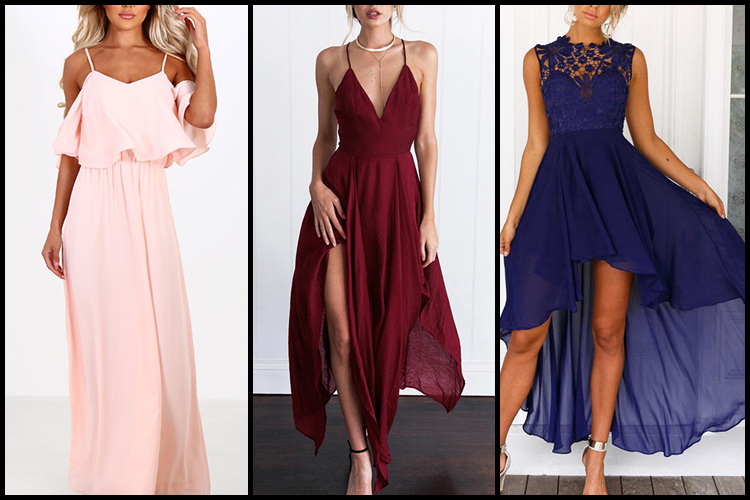 If you've been invited to a marriage, you're sure to rock the look by wearing one of these 3 Yoins pieces. Elegantes, estes vestidos em tecido liso, ficam lindos em uma recepção mais formal tipo um casamento. Se você foi convidada para um matrimônio, com certeza irá arrasar no look ao usar uma destas 3 peças da Yoins. Fashion street, flower print sets are "must" and "need" for every educated woman! Necessary pieces in the women's wardrobe. 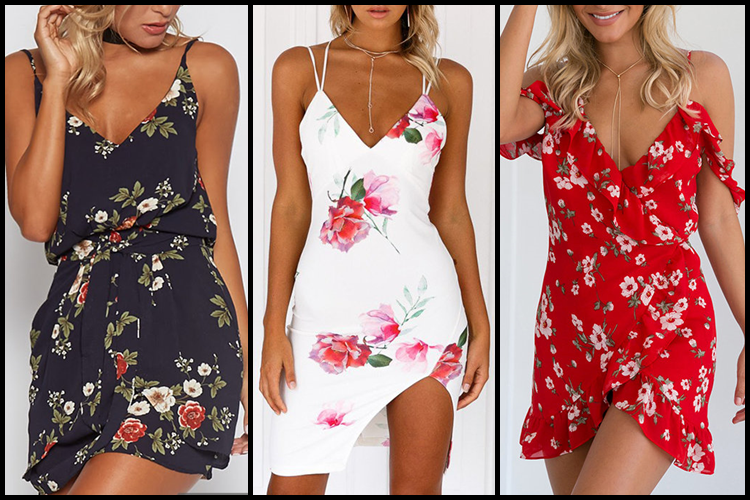 Moda street, conjuntos com estampas de flores são "must" e "need" para toda mulher antenada! Peças imprescindíveis no guarda-roupa feminino. Chic and attractive, the modern woman should have at least one of these pieces of clothing in her fashion wardrobe. Chiques e atraentes, a mulher moderna deve ter ao menos uma destas peças de roupas no seu guarda-roupa fashion. Well, folks, my favorite pieces were the numbers: 3, 9, 10, 12 and 16. I especially loved the black print dress 11. And which one or which of you? Leave your comment! Did you like my selection? And there at Yoins has a lot more cool stuff! Take a break in the store! It's all very beautiful there! Bem, gente, as minhas peças favoritas foram as de número: 3, 9, 10, 12 e 16. Amei principalmente, o vestido preto estampado 11. E qual ou quais a de vocês? Deixe seu comentário! Gostaram da minha seleção? E lá na Yoins tem muito mais coisa bacana! Deem uma passadinha na loja! É tudo muito lindo lá! E não é? E lá no site tem outras coisas lindas e baratinhas também.